ix, 113 p ; 21 cm. Four lively plays based on classic folk tales from around the world: "The Girl and the Snake" (East Africa), "Anansi&apos;s Story" (Caribbean), "The Good Clown and the Bad Clown" (North America), and "Tom Fool" (Germany). The girl and the snake and other short plays / Renata Allen ; introduction and questions by Sheila Hales. 100 Personl Name ME 1 $a Personal name Allen, Renata. $c Statement of responsibility Renata Allen ; introduction and questions by Sheila Hales. 520 Summary Etc. $a Summary, etc. 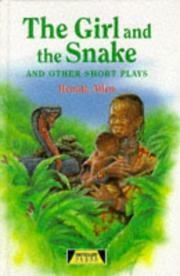 note Four lively plays based on classic folk tales from around the world: "The Girl and the Snake" (East Africa), "Anansi&apos;s Story" (Caribbean), "The Good Clown and the Bad Clown" (North America), and "Tom Fool" (Germany). 650 Subj:Topic 0 $a Source other than LC Children&apos;s plays, English. 700 AE:PersName 1 $a Name Hales, Sheila. 830 SAE:UnifrmTitle 0 $a Uniform title Heinemann plays.